W. W. Norton & Company, 9780393355086, 496pp. From the ashes of World War II, Rome was reborn as the epicenter of film, fashion, creative energy, tabloid media, and bold-faced libertinism that made "Italian" a global synonym for taste, style, and flair. A confluence of cultural contributions created a bright, burning moment in history: it was the heyday of fashion icons such as Pucci and Brioni, and Rome's huge movie studio, Cinecitta, also known as "Hollywood-on-the Tiber," attracted a dizzying array of stars from Charleton Heston and Audrey Hepburn to that stunning and combustible couple, Elizabeth Taylor and Richard Burton, who began their extramarital affair during the making of Cleopatra. Behind these stars trailed street photographers who searched, waited, and pounced on their subjects in pursuit of the most unflattering and dramatic portraits of fame. The scene was captured nowhere better than in Federico Fellini's masterpiece, La Dolce Vita, starring Marcello Mastroianni and the Swedish bombshell Anita Ekberg. 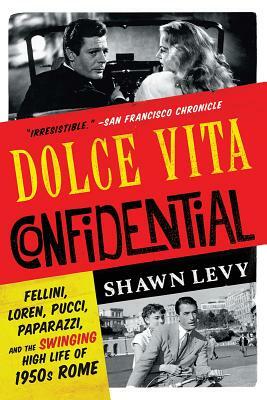 Gossipy, colorful, and richly informed, Dolce Vita Confidential re-creates Rome's stunning ascent with vivid and compelling tales of its glitterati and artists, down to every last outrageous detail of the city's magnificent transformation.